As John Maxwell writes in The 21 Irrefutable Laws of Leadership, “Victorious leaders have one thing in common: they share an unwillingness to accept defeat.” Let’s face it: if you’re constantly leading your team to failure, you’re probably not a very good leader. Maxwell’s Law of Victory states that “good leaders find a way for their teams to win.” They don’t allow failure to be an option. However, it takes a strong leader and a strong team to pull this off. The Law of Victory has three main components. The first is the unity of vision. Teams succeed only when their members share a unified vision; each team member must be in it for the team, not for their gain. Everyone must work in harmony towards the company’s success. The second component is a diversity of skills. As Maxwell writes, “can you imagine a whole hockey team of goalies?” Every organization requires diverse talent to succeed. Seek out team members that can staff your weaknesses. You want each employee to be an expert in what they do, even if you might not be. Finally, the Law of Victory requires a leader dedicated to victory. Leaders are responsible for providing the motivation, resources, and vision for a company to succeed. It takes a real leader to make things happen. Making the Law of Victory work for your business takes more than a desire to succeed. 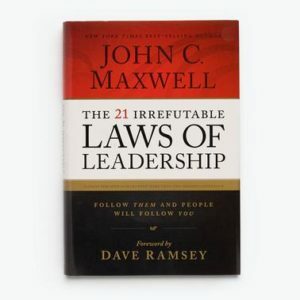 In his chapter on the Law of Victory, John Maxwell outlines a few key steps every leader should take. First, you need to take responsibility for the success of your team. If one member falls short, ask yourself honestly if you gave them all the resources they needed to succeed. Much of the time, if an employee is struggling, it’s because we are not in tune with their individual needs. Also, it’s up to you to lead by example. You must be committed to your business above all things; if you’re not, ask yourself why. It might be a sign that your current goals aren’t aligned with your vision. You have to model the kind of commitment to the company that you want to see in your employees. You also need to have the right people on your team to cover every base. Make a list of skills that you need in your business to achieve success and see if your current staff fits the bill. If not, you will need to either train your existing staff or shuffle people around to make room for new hires. Finally, your team must have a unified vision. This will come quickly if you have a cohesive company culture, as your employees will already be on board with the company values. Maxwell suggests working one-on-one with your team to discover where their personal goals can overlap with the company’s goals. Victory is a team effort, but it’s one that starts at the top. If you need some guidance on leading your team to victory, fill out my contact form, and we’ll schedule a free video call to talk about your business’s needs. 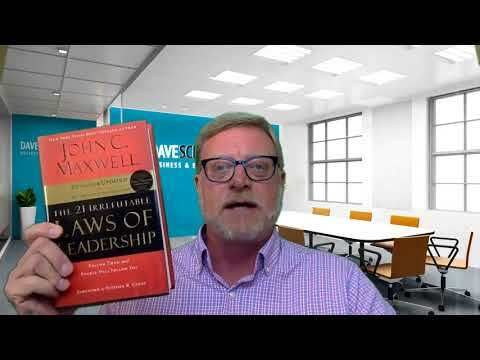 For more information on John C. Maxwell and why I like this book so much, watch the video below. To read more articles in my “Laws of Leadership” series, click here.